In yoga we are taught that prana is the life energy or life principal of the universe. There are three main channels through which the life energy (prana) flows. These channels are called nadis in Sanskrit. These three main channels are called Ida, Pingali and Shushumna and they are inside the subtle physical body. Ida carries the current of life energy on the left side of the body. 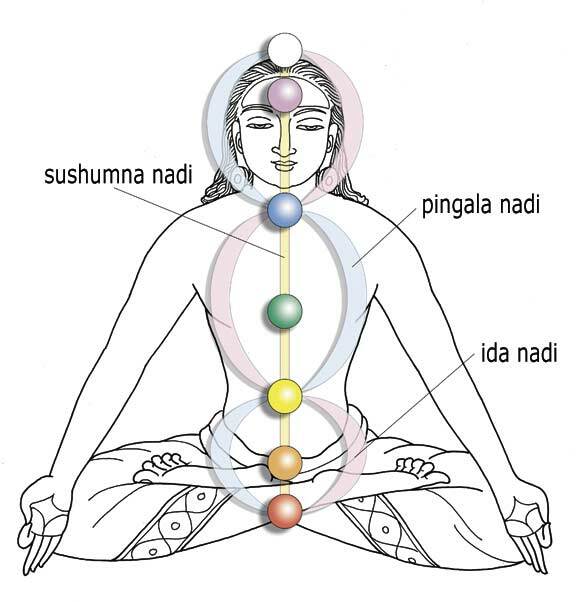 Pingala carries the current on the right side of the body. Sushumna carries the current in the middle of the spinal column. Sushumna is the most important of the three nadis as it receives a ceaseless stream of life energy from universal consciousness. There is an inner connection between Ida and Pingala and the zodiac and planets of the solar system. Ida has a special connection with the moon and Mercury. It’s main qualities are coolness, mildness and creative energy. Pingala is connected with the sun and Mars. Its quality is powerful, dynamic heat. Ida rules the left nostril and Pingala the right nostril. When we breath in and out our left nostril we have to know that it’s Ida functioning. When we breath in and out of our right nostril we have to know that it’s Pingala functioning. When we breath in and out both of our nostrils equally we know that Shushumna functioning. Ida and Pingala meet together at is different places in the subtle body. Each meeting place forms a centre and each centre is round as a wheel and these wheels or centres are called chakras. They are also called lotuses because they look like lotus flowers. The six centres or chakras are called Muladhara, Svadisthana, Manipura, Anahata, Vishuddhi and Ajna. There is another chakra that is inside the upper brain resting just above the head that is called Sahasrara. Apart from these six, there are many other chakras in the subtle physical body. In the knees, toes and even in the fingertips we have minor chakras. Yoga practices aim to to vitalise the whole pranic body and increase the flow of energy through the nadis and release energy blockages in the chakra system. Both asana and pranayama (breath) practices work scientifically to systematically increase the energy and energy flow in the body. This is why yoga is so much more than just a physical practice or fitness regime. It is a way of connecting to and allowing these subtle systems to work optimally for our personal evolution. In the heart of Sandton, tucked away from the bustle and amidst a lush, tropical garden, you’ll find the ISHTA Studio of Yoga & Health, where the sound of birdsong and trickling water fills the air. © Ishta Yoga | All rights reserved 2018 | Created by Banter.